Quiet Cove. Photo by Tom Doyle. 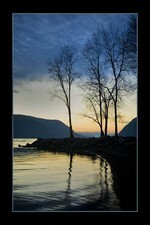 Tom Doyle was at Plum Point on a recent morning when he shot this photo. Doyle says that he likes the difference in tonal values that separate foreground, mid-ground and background in the shot. Tom also recently won some awards in the print competition of the Dutchess rRgional Professional Photographers, details to come.